Our firm is different. It's unique. It truly is one of kind. Because more than 50 years ago, our founders established a trial practice firm that was built upon the Golden Rule: Represent others the way that you would want to be represented yourself. And since our founding, we have stayed true to that mission. As Georgia trial lawyers, we have a long history of success in catastrophic personal injury and wrongful death cases, whistleblower cases, and federal criminal cases in the white-collar area. Our attorneys have also excelled in representing companies, boards of directors, and individuals in SEC investigations and prosecutions, and in corporate governance, internal investigations, and compliance matters. We are also the law firm of the Independent Compliance Monitor and Auditor of Volkswagen AG, Larry D. Thompson, who is counsel to our firm. Unlike many other Georgia trial practice firms, particularly those that handle personal injury and wrongful death matters, we do not advertise. For that reason, you will not find our firm name listed on billboards or bus stops. We get most of our cases the old fashioned way. Other lawyers, former clients, and family members of those we have helped in the past call us because they know that we work hard, return phone calls, and treat people with compassion and respect. In addition, they know that in personal injury, wrongful death, whistleblower and white collar matters, we have the experience and substantive knowledge that one must possess to obtain exceptional results. 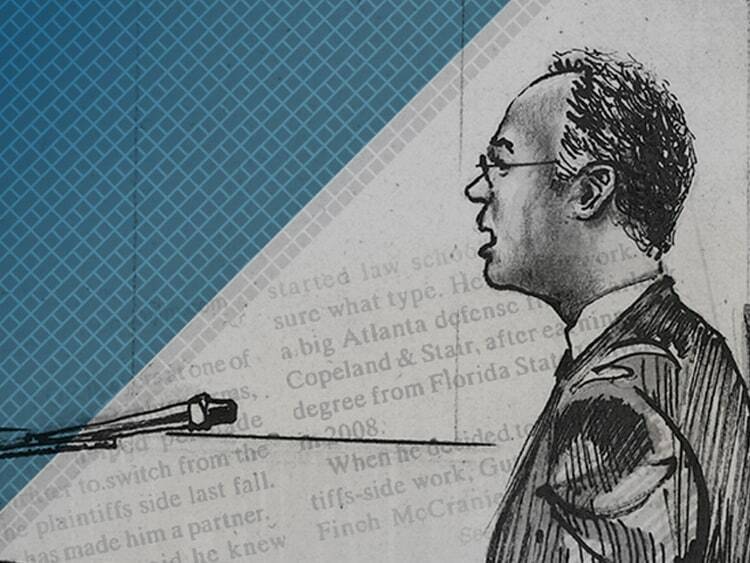 These days, the phrase “trial lawyers” seems to get tossed around a lot. But for our firm, the phrase “trial lawyers” has real meaning. That’s because we actually try cases, before real juries and real judges. Indeed, in terms of trial work and courtroom experience, you would be hard pressed to find a firm that comes anywhere close to matching the number of hours and days that our lawyers have spent in the courtroom. In personal injury and wrongful death matters, we have set records for the highest jury verdicts in Georgia, and then we have gone on to break our own records. And in federal criminal cases in the white collar area, we have tried and won cases that other lawyers believed could not be won. Although a trial is not always the best option for getting a case resolved, sometimes, presenting your story to a jury or judge is the only way to obtain the result that you truly deserve. And when opposing lawyers know that your lawyer is not afraid to go to court, that can often result in a much more favorable settlement or pretrial resolution. With respect to personal injury and wrongful death matters, we were one of the very first firms in Atlanta to make a commitment to those who have been seriously injury or killed due to the negligence of others. In fact, we began handling personal injury and wrongful death matters in 1966, decades before lawyers began to advertise for these cases. But just as it was back when we started over fifty years ago, we still get most of our personal injury and wrongful death cases from other lawyers, and from individuals or family members of individuals that we have helped in the past. Other lawyers routinely bring cases to us because they know that we not only have the substantive knowledge and experience to handle complex personal injury and wrongful death cases, but they also know that we have the financial resources to properly fund a case, which usually results in a much better recovery for the individuals and families that we represent. In addition, we enjoy working with other lawyers, and we have very generous and flexible referring attorney arrangements. In terms of substantive knowledge and experience no lawyer can truly say that he or she has “seen it all.” That’s because every case is different and unique in its own way and what may be true in one case, may not apply in a substantially similar case. But as noted, our firm has been handling serious personal injury and wrongful death cases for over 50 years. As a result, we have developed a level of substantive knowledge and institutional expertise in this area that is simply not possessed by most other firms. As can be seen from reviewing our practice area pages, we have obtained exceptional results in medical malpractice cases, tractor trailer cases, governmental liability and police chase cases, products liability cases, serious automobile accident cases, and a host of other matters in the personal injury and wrongful death area. In addition to our personal injury and wrongful death practice, we also have a very active and successful whistleblower and False Claims Act (aka Qui Tam) practice. Just as it was with our personal injury and wrongful death practice, we were one of the very first firms in Georgia to begin handling whistleblower and False Claims Act cases. In fact, our practice in this area started over 30 years ago – just two years after the enactment of the Modern False Claims Act. Because of the expertise that our firm developed in the whistleblower area, federal and state authorities consulted with our firm as both the United States and the State of Georgia enacted provisions that were designed to expand upon the whistleblower provisions that were first implemented at the federal level. In addition, our lawyers have a level of practical knowledge and real world experience that is unmatched by other firms, which makes us uniquely qualified. Our whistleblower lawyers have served at high levels within government, including decades of experience as federal prosecutors and private attorneys handling significant whistleblower matters. Our practical experience enables us to not only counsel individuals during the often difficult process of determining whether to become a whistleblower, but it also allows us to assess the case, identify the claims that need to be filed, and determine the most appropriate jurisdiction in which to file the case. The third area of our trial practice focus is white-collar criminal defense. In fact, we have one of the most well-established and formidable white-collar crime practice groups in the Southeast. Also established over 30 years ago, our lawyers have over 100 years of combined experience handling substantial white-collar cases. Our white-collar team includes a former Deputy Attorney General of the United States, a former Director of the Atlanta Office of the SEC, several former federal prosecutors and a former federal public defender, every one of whom has handled significant white-collar matters. We have successfully resolved matters very quietly without an Indictment or formal charge ever being filed. But unlike other firms that exist these days, our lawyers have real experience defending cases in court when the United States of America is on the other side, and working a case out is just not possible. We have aggressively and successfully litigated against the United States in the preindictment phase, the pretrial motion phase and in trial after trial in federal court. In addition, members of our white-collar team also have exceptional research, analytical, and organizational skills – which is essential in the massive “document dump” cases that are so common these days. In sum, Finch McCranie LLP’s Georgia trial lawyers have a long track record of success in personal injury, wrongful death, whistleblower and white- collar cases. And most importantly, we continue to adhere to the course that our founders set in place for us over 50 years ago: Represent others the way that you would want to be represented yourself. In our view, the individuals and the families that we represent deserve no less. If you have a personal injury, wrongful death, whistleblower or white collar matter, please do not hesitate to give us a call at (404) 658-9070. We would be happy to speak with you. For us, the practice of law is more than just a job; instead, it’s a calling. It allows us to make a difference in the lives of the individuals and the families we represent. We handle serious personal injury and wrongful death cases, whistleblower cases and federal criminal cases. And serious cases like these need the very best lawyers. But individuals that are involved in serious matters like these, deserve much more than a highly skilled and competent lawyer: They also deserve a lawyer that will treat them with respect, dignity and compassion. And that’s what we do. Let’s face it, when handling serious personal injury and wrongful death cases, whistleblower cases, and federal criminal cases, there is no substitute for experience. And like in life, lawyers learn from their experiences and use the knowledge and wisdom gained as they progress throughout their careers. In terms of experience and judgment, we certainly have it. Our lawyers have experience serving as high-ranking government officials, federal prosecutors, a federal public defender, and as trial attorneys battling insurance companies. In fact, you would be hard-pressed to identify a firm the size of ours that possesses the experience, judgment and wisdom that our lawyers possess. Every case is different, of course. And in serious personal injury and wrongful death cases, whistleblower cases and federal criminal cases certain things can happen along the way that no lawyer can control. But time and time again, we have proven that with hard work, strong advocacy, and working as a team, exceptional lawyers can obtain exceptional results. And unlike other firms, we are not afraid of the tough cases. In fact, we regularly succeed in cases that other lawyers think cannot be won. In the end though, actions and results speak much louder than words, and we have a demonstrated record of success that spans over 50 years. Fill out the contact form or call us at (404) 658-9070 to schedule your free consultation.